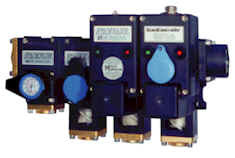 The StackPulse Controller™ , StackController™ and the StackValve™ are a highly versatile electrically activated manifold/flow valve. 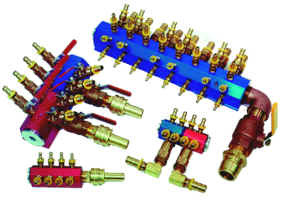 Many combinations can be assembled, as shown to provide a compact high volume cooling distribution manifold. 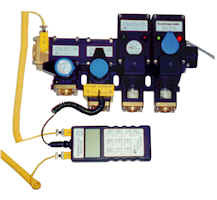 All manifolds are sized to meter the flow of each circuit. The inlet port size is the same as, or larger than, all outgoing ports combined. This maintains high flow, efficient cooling. You can specify model, size, and number of location of all outlet and inlet ports to achieve precision flow patterns for your particular application. Flow Indicators are intended for providing visual indication of liquid flow. It can be applied in a variety of applications and environments. Available in ⅜” or ¼” NPT, BSPT, or BSPP to meet whatever your specifications require. The Flow Readout™ is a portable hand held flow measuring instrument. The best way to use our Inline™ manifolds is with the quality brass fittings that we stock for all of your plumbing needs. We stock Push-Loc Hoses in Red and Blue for color coding supply and return lines. 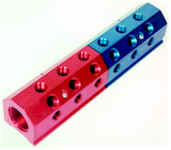 Blue and Red Hose are available in 1/4", 3/8", 1/2", 3/4" and 1" Sizes. Red and Black Hose are available in 1", 1 1/4", and 2" Sizes. Copyright © 2015 CITO Products, Inc.